Amazing place to buy a car!!! Trina at the Barton st location was very professional and helpful with the purchase of my 2014 Jetta tdi!! She made the process super easy and got me a great deal!!! I 100% recommend you check out Daleo Motors for your next vehicle purchase!!! Very satisfied with the service.. Very friendly wecwere asked what we would like in a vechile . They were very friendly .Also took the time to sit with us n go over any questions we had n gave us great information. We are very satisfied with our vechile as well as the services. This was our second purchase from Daleo and we would recommend them to anyone. Great service. Thank you to everyone involved. Amazing - would recommend to anyone! Trina was incredible to work with. She made the entire experience a breeze and since it was my first dealership car purchase I had no idea what to expect. I didn’t know what kind of car I was wanting but Trina was confident that they would find me a car that suits me best. I’m so beyond happy with my purchase and would recommend her to anyone. Hi Caurisa, We are so glad Trina was able to give you a great first dealership experience! We are happy Trina was able to get you into a car to suit you perfectly! We hope you are enjoying your new car and hope we see you again! 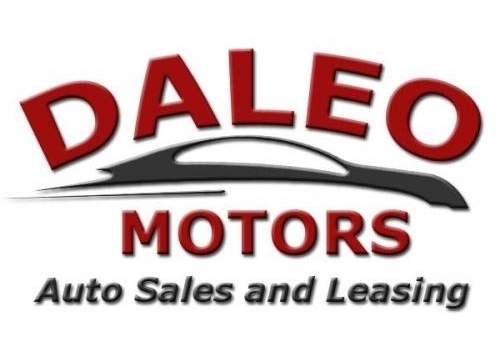 DALEO MOTORS, AUTO, CAR, TRUCK, SUV, SALES, & LEASING SALES, is located at 1575 MAIN ST E AND 850 BARTON ST EAST in HAMILTON, ON, has been home of the Better Deal since 1983. We have become a premier retailer of Pre-owned vehicles. Our dedicated sales staff is here to make your auto shopping experience fun, easy and financially advantageous by understanding and catering to your needs. Please utilize our various online resources and allow our excellent network of people to put you in your ideal car, truck or SUV today! We are proud members of the Used Car Dealers Association (UCDA), Ontario Motor Vehicle Industry Council (OMVIC), and the Better Business Bureau (BBB) A+ accredited.